The Prophet Mohammed (PBUH), is the final Messenger of God sent to deliver His Message to the entire humanity. He was a model for all humanity. Human beings try to imitate the model of someone whom he admires. The life-style or examples of those individuals is perceived to bring a new insight and success in their activities. True success can be achieved only if one follows the guidance from the Holy Quran, and the teachings and practices of Prophet Mohammed (PBUH). The Prophetic Model is an ideal example for us to imitate in all our activities. The Holy Prophet (PBUH) was an example on how the Divine Message could be applied in practical form. He demonstrated the practical explanation of the Guidance revealed to him. Prior to the advent of Prophet Mohammed (PBUH), the land of Arabia was in barbaric and uncivilized culture; immorality and social evils were deeply rooted among the people. Women were suppressed and slavery was rampant. Ignorance and illiteracy was common among the Arabs. Within a span of twenty-three years Prophet Mohammed (PBUH) reformed the whole of Arabia. Prophet Mohammed (PBUH) is the greatest personality in history. Words fail to convey the greatness of his personality. 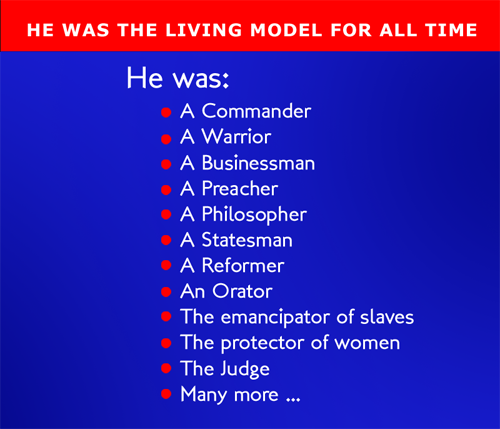 He was the living example of all virtues. He was a person of high ethics and discipline. He was an impeccably honest man of Noble virtues. Prophet Mohammed (PBUH) is the greatest of all standards of human personalities. Michael H. Hart, in his book, "The 100, A ranking of the most influential persons in history" has ranked the first place to Prophet Mohammed (PBUH). He says ".....He was the only man in History who was supremely successful on both secular and religious levels" Encyclopedia Britannica says, "Mohammed is the most successful of all Prophets and religious personalities." His life is a shining example for all people at all places and at all times. He taught people the Unity of God and the concept of universal brotherhood. His lifetime practices like purity, cleanliness, dignity of work, trade, marriage, charity, humanity, sympathy, love, trust, humbleness, recreation, kindness, ethics, unshakable faith, sublime character etc., range from individual, family community, society to international levels. He is the hero for all times and his life model is the best example for humanity. He was a man with greatness of purpose, smallness of means and with astounding results. The greatness of purpose was to preach the Unity of God and to establish the True religion. The smallness of means was that he lived a simple and modest life. Even though he was a ruler of Arabia he was without any materialistic possession. His influence is so supreme even after the lapse of centuries his teachings and life examples are still held as model. Let us follow this glorious example. 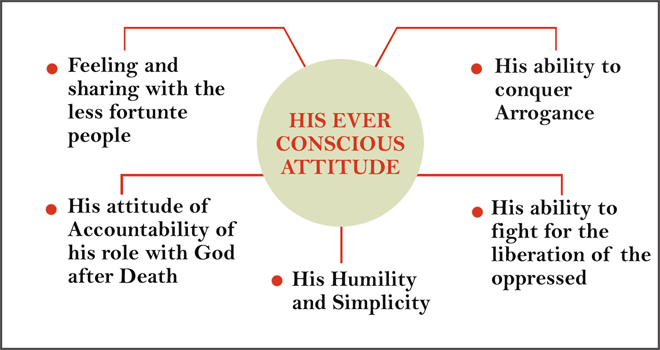 Principle Four is to imitate the model of Prophet Mohammed (PBUH) as an ideal model in character and competency.